Eastern Region has a strong history in automobile manufacturing. Post-independence the Ambassador Car of Hindusthan Motors has ruled the country for decades. Ambassador was the first indigenous car manufactured in the country which was also the official car of the Government of India for a long time. TELCO, today’s Tata Motors was the pioneer in manufacturing commercial vehicles and is still having the considerable market share in the country. The Auto Cluster in Jamshedpur is working in the same pace, in tandem with Tata Motors. So Eastern India has that potential to take part in such a sophisticated industry and as well diversify to similar manufacturing line. 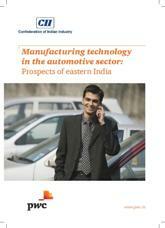 In view of the above, CII jointly with PwC conducted a survey among the industry leaders to capture their views and suggestions on considering the eastern region as a potential hub of automobile and auto component manufacturing. Responses were positive and recommendations were more inclined towards the adoption of technological marvels available in forms of smart manufacturing tools and Industry 4.0 based best practices. Survey findings were compiled and this report was published jointly by CII and PwC which was launched at the CII ER Annual Regional Meeting 2018 on 17 March 2018 in Kolkata.